The Republic of Malta is a small, island country in the Mediterranean Sea that lies south of the island of Sicily. Malta is an archipelago, but only the three largest islands of Malta, Gozo and Comino are inhabited. The landscape of the islands is characterised by terraced fields, dry vegetation, rock and limestone. This is due to the long hours of strong sunshine that they receive throughout the summers, which are usually dry and hot. The average annual temperature is around 23°C. It is one of the smallest and most densely populated nations in the world and has two official languages, Maltese and English. Malta’s location in the middle of the Mediterranean has historically given it great strategic importance as a naval base and a crossroads between Europe, North Africa and the Middle East. A succession of powers, including the Phoenicians, Carthaginians, Greeks, Romans, Byzantines, Arabs, Normans, Sicilians, Spanish, Knights of St. John, French, and British have ruled the islands, each adding to the distinctive mix. Malta is particularly known for its connection with the Order of the Knights of St. John, who were given the island by the Spanish king Charles V. They introduced the Italian language to the island, built the city of Valletta, and developed the cultural and economic links through the region. The islands voluntarily became part of the British Empire in 1800, and the importance of their location greatly increased after the opening of the Suez Canal. During the early years of the Second World War, Malta came under concentrated bombing and naval siege by the Axis powers – so much so that in 1942 King George VI awarded the whole Maltese population the George Cross in recognition of their bravery. A depiction of the medal was then incorporated onto Malta’s national flag. 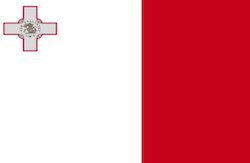 Malta gained independence from the United Kingdom on the 21 September 1964, and became a republic in 1974. It joined the European Union in 2004 and in 2008 it became part of the eurozone. The parliamentary system is closely modelled on the Westminster system. The parliament is made up of the president, a prime minister and the multi-party House of Representatives. The country is also divided into five regions, with each having its own Regional Committee. The Government of Malta is the executive branch. The Prime Minister is appointed by the President of Malta, with the President making their decision based on the situation within the Maltese parliament. The House of Representatives consists of 65 members, 5 members of parliament being elected from each of the thirteen electoral districts. The role of the President of Malta is largely ceremonial, and he/she is appointed by the House of Representatives for a five-year term. The Labour Party currently runs the government, the Prime Minister being Joseph Muscat. Malta is a highly industrialised, high-income, advance service-based economy – with a standard of living slightly above the EU average. It is a member of the European Union and of the eurozone, having formally adopted the euro on 1 January 2008. Malta’s main advantage has always been its central location for trade, and the economy reflects that. Being a small island it has limited natural resources and can only produces around 20% of the food requirements for its relatively large population. The economy therefore is dependent on human resources and foreign trade. Malta’s economy is driven by financial services, tourism, real estate, Igaming and manufacturing, particularly of electronics. Other significant sectors are pharmaceuticals, information technology, and call centres. There is a strong manufacturing sector for products like electronics and pharmaceuticals, and the manufacturing sector has more than 250 foreign-owned, export-oriented enterprises. Film production is another growing industry, bringing in €35 million between 1997 and 2011. The Maltese government introduced financial incentives for filmmakers in 2005, and currently foreign productions can can get up to 27% back on spending incurred. Malta produces almost all its electricity from oil, and energy costs, sometimes seen as the highest in Europe, have become an issue. The government is looking into the potential of solar and wind power and Malta and Tunisia are currently discussing the commercial exploitation of petrochemicals on their shared continental shelf. With entry to the EU, the Maltese Government has pursued a policy of gradual economic liberalisation and privatisation, taking steps to shift the emphasis from reliance on direct government intervention and control to policy regimes that allow a greater role for markets. In 2007 the government sold off its 40% in MaltaPost, completing an ongoing privatisation process. In 2010, Malta privatised telecommunications, postal services, shipyards and shipbuilding. Malta has managed to maintain a relatively low unemployment rate, mainly because of the constant growth and by policies encouraging continuous training for the labour force. Malta ranks high on global inward foreign direct investment comparisons and is among the top twenty countries most likely to sustain economic growth. Malta didn’t suffer in the same way as other jurisdictions during the eurozone crisis, because of low debt and sound banking. The judiciary, fairly independent and efficient, provides strong protection of property rights. The World Economic Forum’s Global Competitiveness Index 2015-2016 placed Malta amongst the top 20 financial jurisdictions. The financial regulator, the Malta Financial Services Authority (MFSA), is the single regulator for financial services in Malta. It was established in 2002, taking over supervisory functions previously carried out by the Central Bank of Malta, the Malta Stock Exchange and the Malta Financial Services Centre. The Authority is an autonomous public institution and reports to parliament on an annual basis. It aims to attract businesses, especially aircraft and ship registration, banking licences and also fund administrators. A core part of the growth strategy of the island includes aiding service providers to these industries, including fiduciary and trustee business and encouraging EU compliance. The MFSA forms part of the Single Supervisory Mechanism (SSM) within the European Central Bank and participates in the SSM Supervisory Board decision making. Other key bodies are The Central Bank of Malta (Bank Ċentrali ta’ Malta), which has responsibility for monetary policy and the promotion of a sound and efficient financial system, and FinanceMalta, which is the quasi-governmental organisation tasked with promoting Malta as a jurisdiction for finance, banking and insurance. Malta does not have a property tax. Because of pressure from population growth and interest from foreign investors, the property market has been in constant boom, especially in towns like St Julian’s, Sliema and Gzira and around the harbour area. Tourism in Malta began to grow from the mid-1960s, fairly consistently to the present day – with some up and downs which were mainly due to rises and falls in the global situation. The advent of low-cost travel has added impetus to this over recent years. In 2017, over 2.2 million tourists visited the island, contributing an estimated 27% to GDP – 307,909 visitors more compared with the preceding year. There are presently four times more tourists visit than there are residents. Tourist arrivals and foreign exchange earnings derived from tourism have steadily increased over the last 30 years. As part of the Schengen Area, EU visitors can travel freely. While Malta cannot unilaterally drop the requirement for nations it makes agreements with to obtain visas to enter the Schengen Area through its border crossing points, it is permitted to offer visa facilitation agreements to some nationalities. The sector is overseen by the Malta Tourism Authority, and the Minister for Tourism, the Environment and Culture. Visitors are attracted by the island’s rich history and culture, and the use of English, but medical tourism has also become popular in recent years, helped by government efforts to market the practice in the UK. The increased numbers of visitors has increasingly stretched resources and put pressure on the existing infrastructure (such as water, waste management, beaches and roads), with overcrowding especially during the summer months. Tourist arrivals increased by 15.7% in 2017, after increasing by 10.2% in 2016. The total contribution of travel and tourism to GDP was €2,425.5m, 26.7% of GDP in 2016, forecast to rise by 5.6% in 2017, and to rise again by 4.5% pa from 2017-2027, to €3,992.9m, or 34.6% of total GDP in 2027. In 2016, the total contribution of travel and tourism to employment, including jobs indirectly supported by the industry was 27.8% of total employment (49,500 jobs). This was expected to rise by 2.5% in 2017 to 50,500 jobs and rise by 2.7% pa to 66,000 jobs by 2027 (37.3% of total). Visitor exports generated €1,458.0m, 9.9% of total exports in 2016. This was forecast to grow by 7.1% in 2017, and grow by 5.3% pa, from 2017-2027, to €2,616.6m in 2027, or 14.4% of the total. Travel and tourism investment in 2016 was €230.6m, 10.5% of total investment. Again, it was estimated to rise by 3.5% in 2017, and rise by 3.4% pa over the next ten years to €331.8m in 2027, or 11.7% of the total. The United Kingdom and Italy remained Malta’s most important source markets, accounting for 24.7% and 16.0% of total visitors, respectively. Germany and France remained the next most important markets. Malta’s performance compared positively with other countries. According to the World Tourism Barometer, arrivals in Southern and Mediterranean European countries grew by an annual rate of 12.6%, while the global tourism industry registered a 6.7% increase in 2017. Cruise liner passengers, mostly from the UK and the US, are also an important addition, Numbers rose in 2017, reaching 658,203, an increase of 7.0% on 2016. According to the Central Bank, the economy is expected to see 6.8% GDP growth in 2018, falling to 4.8% in 2019 and 4% in 2020. Aside from these, the Central Bank also has said its projections for the government balance were also looking better than first expected, with the debt-to-GDP ratio falling to 44.6% by 2020. Domestic demand is expected to replace net exports as the main driver of economic growth. The government budget is also forecast to remain in surplus and Malta’s debt-to-GDP should fall below 50% for the first time in more than 20 years. Introduced at the beginning of 2014, the Malta Individual Investor Programme (IIP) offers high and ultra-high-net-worth individuals worldwide citizenship in a highly respected EU member state. Gaining citizenship in Malta via investment is a simple, quick process which can allow the entire family to immigrate with ease. Citizenship is typically approved after just four months processing time. Family eligibility extends to parents of the applicant and spouse, minor children and unmarried adult children under 27. Descendants gain citizenship automatically. Citizenship by investment entitles the holder to visa free travel to more than 166 countries and gives the right to live, work and study in any country in the European Union. The Maltese tax system is based on domicile and residence, rather than citizenship. Tax is only due on income and capital gains arising in Malta. After a period of five years property can be sold in Malta completely tax free, so long as it was the resident’s sole residence for at least three years. If selling the property before three years of residence a tax of 12% is charged on the selling price. In addition, there are no inheritance or death taxes, no net worth or wealth taxes, no municipal taxes, rates or real estate taxes and no estate duty. With tax benefits such as these, a stable economic climate and banks ranked as some of the most stable in the world, investment in Malta is a sound way to gain citizenship. Simply wish to say your article is as surprising. The clearness in your post is just great and i could assume you are an expert on this subject. Well with your permission let me to grab your feed to keep updated with forthcoming post. Thanks a million and please carry on the gratifying work.